Maintains correct moisture levels in the hoof, preventing cracking, flaking and breakage. Also assists new hoof growth by keeping the coronary band tissue supple. Conditions and moisturizes the keep your horse’s feet in top condition. Great for summer conditions and seasonal changes from wet to dry. 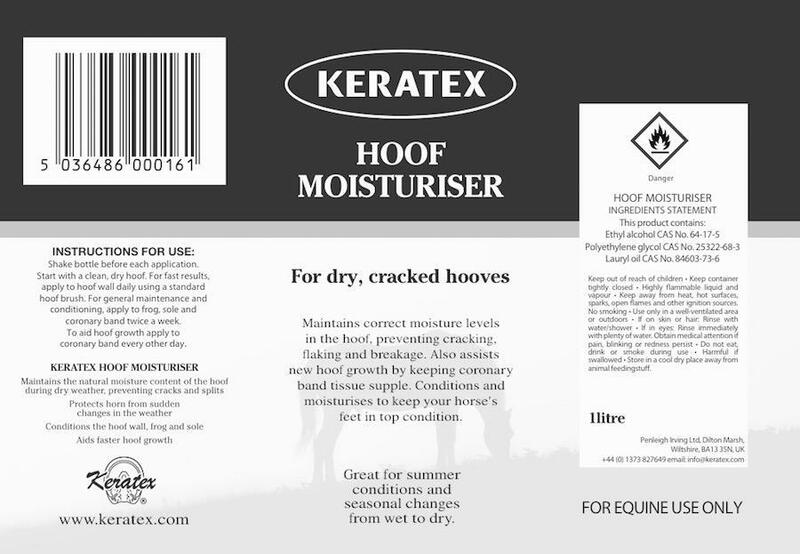 Keratex Hoof Moisturiser maintains the natural moisture content of the hoof during dry weather, preventing cracks and splits. Protects horn from sudden changes in the weather. Conditions the hoof wall, frog and sole. Aids faster hoof growth. Instructions for use: Shake bottle before each application. Start with clean, dry hoof. For fast results, apply to hoof wall daily using a standard hoof brush. For general maintenance and conditioning, apply frog, sole and coronary band twice a week. To aid hoof growth apply to coronary band every other day. Hoof Moisturiser Ingredients Statement. This product contains: Ethyl alcohol CAS No. 64-17-5. Polyethylene glycol CAS No. 25322-68-3. Lauryl oil CAS No. 84603-73-6. Keep out of reach of children. Keep container tightly closed. Highly flammable liquid and vapour. Keep away from heat, hot surfaces, sparks, open flames and other ignition sources. No smoking. Use only in a well-ventilated area or outdoors. If on skin or hair: Rinse with water/shower. If in eyes: Rinse immediately with plenty of water. Obtain medical attention if pain, blinking or redness persist. Do not eat, drink or smoke during use. Harmful if swallowed. Store in a cool dry place away from animal feedingstuff.